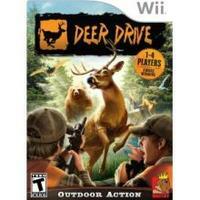 Deer Drive is a hunting game that places emphasis on arcade-style shooting and multiplayer gaming. Solo players can use the Wii Remote or Wii Zapper to head out and bag the biggest bears, moose, and deer around, all while braving inclement weather, dynamic hunting conditions, and varied terrain. Two players can compete to kill the most animals in "Competition Mode," while up to four can square off in "Party Mode," where One player's success means other competitors have to deal with shaken, obscured, and upside-down screen views.